There’s a strange little bug that’s becoming more frequent within cPanel that I think is worth addressing. The bug, in this case, is the usage bar for Virtual Memory Usage showing as full, even though the actual usage isn’t anywhere near full. You’ll notice this bug pretty much right away when you login to your cPanel. You’ll be greeted by a red bar under your Stats section similar to what’s shown in the screenshot below. As you can see, this can be a bit startling when you first log in to see a full usage bar. What you’ll notice, though, is the number above the bar shows barely any usage at all (0.3mb out of 1024mb). That is the actual usage. What we’ve been told from cPanel is that they are aware of this bug but aren’t planning on fixing it because they are doing away with the x3 theme. There is, however, a fix to this bug, and that fix is to switch from the outgoing x3 theme to the new cPanel Paper Lantern theme. How to accomplish this is fairly straightforward. After logging in to your cPanel you’ll see a dropdown menu at the top that says “Switch Theme” with x3 currently selected. What you’ll want to do is click on the dropdown menu and switch from x3 to Paper Lantern. Fair warning: The Paper Lantern version of cPanel is vastly different than x3. It may come as a bit of a shock to you when you switch over because it looks completely different than the outgoing version. When you make the change you’re going to see something similar to the screenshot below. As you can plainly see, this is a complete change from what the old x3 used to look like. In fact, cPanel has gone so far as to change the names of certain icons/areas (from parked domains to Aliases, for example). The paper lantern theme has come under quite a bit of scrutiny becasue of how different it looks, which is why we’ve been hesitant to force a change across all accounts. The reality is that eventually we are going to have to do this because x3 is going to be gone and there’s nothing we can do about that. The good news is that if you don’t much care for this new Paper Lantern theme, you’re not alone. There’s been so much complaint about it that cPanel has gone so far as to make a new style for Paper Lantern that mimics the look of x3. 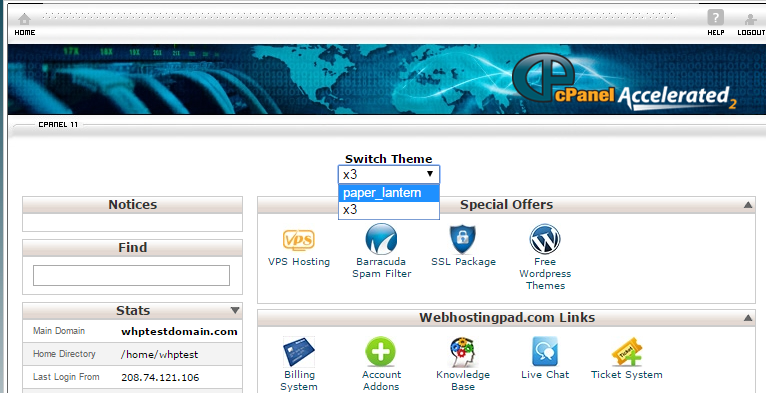 This allows you to use the new cPanel theme with a style you’re comfortable with. In order to change the style, simply click on your username in the upper right hand corner and choose “Change Style” from the dropdown menu. In the new window you’ll see an option for a “Retro” style which you can select to take you back to the old x3 style layout. In doing so your cPanel will look like the screenshot below. As you can see, the issue with the memory usage bar is gone and the cPanel looks like the old version. Keep in mind that the icons will still have their new names, so places like the old domain redirect area will now be called “Aliases.” Everything else, for the most part, will function just like your old cPanel interface, just quicker and more efficiently. As always, if you have any questions about this or anything else let us know, we’d be happy to help you out!